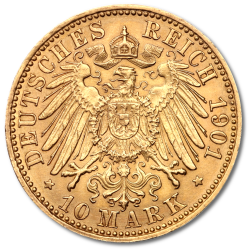 German Empire (Deutsches Kaiserreich) gold coins were last minted over 100 years ago, yet most of those available today are in excellent condition. Collectors choose Deutsches Kaiserreich gold coins as a unique reminder of Germany's Imperial era and these sought-after coins recall a past where a united German state was a dominant power in Europe. The Deutsche Reich was founded in 1871 following success in the Franco-German War. German Empire Marks paved the way for the currency that was used in Germany until 2002. These beautifully preserved gold coins were struck from .900 gold and the most widely available German Empire Gold Coins include the 20 Mark Wilhelm I and Wilhelm II coins and you'll find these and other Gold Marks such as King Albert of Saxony and King Otto of Bavaria gold coins VAT free. The historical and numismatic value of the Deutsches Kaiserreich offers great value for money for investors and promise and excellent return on investment. Considering these precious bullion coins have not been made for over 100 years, a vast majority of the coins are still in excellent condition which makes them a highly attractive proposition to coin collectors. Deutsches Kaiserreich gold and silver coins are part of Germany’s Imperial era legacy. In the eyes of the investors, these imposing coins bring back memories of a united and dominant German state that hammered the character and values of its people for the years to come. When the German Empire was founded in 1871 after victory in the Franco-German War, the state was also granted the prerogative of coinage. According to a decision of the Federal Assembly of 7th December 1871, alphabetic characters were allocated to the individual Mints for identification purposes. They were arranged according to the order of priority at that time, with the letter "A" representing the Berlin Mint. Berlin was the capital city of the Kingdom of Prussia after 1451. Most commonly found are the Deutsches Kaiserreich 20 Mark gold coins of Wilhelm I and Wilhelm II, as 10 and 5 Mark denominations were minted in smaller quantities, while coins issued in 1888 are of particular numismatic interest with three different portraits being used. Kaiser Wilhelm I died that year, his critically ill son Kaiser Friedrich III succeeded him to the throne, but succumbed to laryngeal cancer after 99 days and was replaced by the last German emperor Wilhelm II. The German Empire existed until the defeat in World War I in 1918. When the empire collapsed overnight following the November 1918 Revolution, Wilhelm II abdicated.The revolutionary period lasted from that time until the establishment of the Weimar Republic in August 1919.The defeat and aftermath of World War I, and the penalties imposed by the Treaty of Versailles, shaped the positive memory of the Empire, especially among Germans who distrusted and despised the Weimar Republic. Germany has used the word "Mark" to define its currency since it was unified as a country. As part of the creation of the empire, a monetary reform was carried out and the silver Vereinsthaler was replaced by the Mark as legal tender. It soon became a unit of account in much of Europe and was called the "Goldmark" from 1873 being equivalent to 2/3 British Pounds. In 1874, the abbreviation "M" (Mark) on the coin was abolished and replaced by the word "Mark". In the design introduced in 1890, the Imperial Eagle bearing the Hohenzollern shield became larger and with a small shield. Gold marks were issued from 1871 to 1915 during World War I when they were taken off of the gold standard. They remain of high numismatic and historical interest for gold coin collectors. Deutsches Kaiserreich 20 Mark gold coins were produced in .900 fineness, the gold/copper alloy increasing their scratch and dent resistance. They are 22.5 mm in diameter, 1.40 mm thick and weigh 7.965g (fine weight of 7.16g). The obverse of the coins we find a portrait of the respective emperor and inscribed the words "DEUTSCHES KAISER KÖNIG v PREUSSEN", preceded by the name of the monarch. The mintmark is also found on this side. On the reverse we see a design of the coat of arms with the Imperial Eagle (Reichsadler),the shield and the crown adorned with a ribbon. Inscribed we find the words "DEUTSCHES REICH", the nominal value and the year of issue. The mints that produced the Deutsches Kaiserreich coins can be identified by looking on the obverse side of the coin.The mintmarks were introduced as hand-held presses were replaced with mechanical ones, and production became more massive. On 20 Mark coins we find, almost without fail, the letter "A" for the Berlin Mint (Staatliche Münze Berlin) which was delegated to issue the greater part of the gold circulation coins, although the Bayreuth and Cleve mints contributed as well. The most prolific state for issuing coins was Prussia, as the largest, wealthiest and most influential, so that the most commonly encountered German gold coins are the 20 mark pieces of Prussia. The Berlin Mint had been in operation since 1750, during the era of Frédéric II of Prussia. Deutsches Kaiserreich gold coins are excellent ambassadors of the culture and history of their country. Their austere design, superior German manufacturing quality and precise production standards. Add to this their pronounced historical significance and the numismatic value of these grandiose coins is guaranteed, making them a precious part of any coin collection. Most Deutsches Kaiserreich coins are in excellent condition, even those that were issued are almost 100 years old. In fact, due to their smartly calculated alloy and immaculate craftsmanship, they retain a delightful patina showing that they have aged well - and this feature is impossible to duplicate. As one of Europe’s leading precious metal dealers, we are always interested to hear from anybody with gold and silver bullion coins for sale. We offer highly competitive rates at current market prices, so if you have any Deutsches Kaierreich coins for sale we would love to hear from you. To get a quote, contact a member of our friendly staff and they will prepare an offer for you based on the latest spot prices. The fixed offer will then be confirmed in writing and delivered by email.